Wi-Fi Direct is a great way of connecting to other devices to perform simple tasks. The main difference between this and many other similar services is that you don't need to be connected to the internet to start sharing and connecting with others. As well as phones, Wi-Fi Direct can also be used in conjunction with several other electrical devices. For example, using Wi-Fi Direct, you can quickly send your files to a nearby wireless printer or transmit video from your phone to your TV. Although it isn't available on all Android devices, as of yet, it's still a great piece of software, that's easy to get to grips with. From your device’s home screen, open up your Settings menu and navigate to the Wireless and Networks tab. If your device is Wi-Fi Direct compatible, you should see it listed near the bottom of all your settings here. By default it will be switched off, so flick the switch to activate it. After opening up the Wi-Fi Direct menu, press on the Options button on your device, and select Device name. This will now bring up the keyboard on your device, and allow you to enter a name which will represent your phone when other people search for it. Press the OK button once you’ve completed it. Press on the Scan button when you’re ready to start searching for other devices and electrical items to connect to. 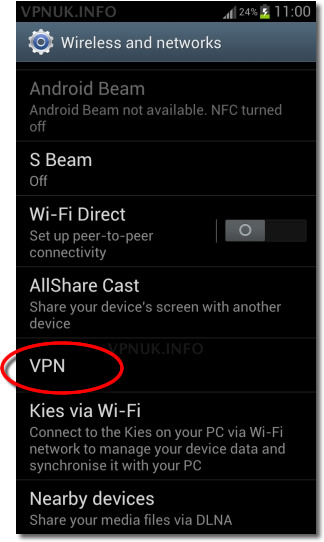 Any devices that then appear on your screen are Wi-FI Direct compatible, such as phones that have the feature turned on. In a similar fashion to Bluetooth, you’ll need to enter a PIN code to connect. From the list of options you’re presented with, select the one you want to connect to. No matter what you’re connected to, you can begin sending files to it. Open up the Gallery app on your device, or any other app where your media files are kept, and press on the Share button usually located on the top of the app. From here you should now see the Wi-Fi Direct option become visible. Select it and your file will begin transferring. Next to the Scan option is Multl-connect. Not only does this option let you connect to numerous devices at the same time, It’s also the best way to connect to another device if you want to play games. Not all devices support the Multi-connect feature, so you’ll need to select it once you have scanned for devices to see which ones are compatible. You’ll find most televisions do support the Multl-connect feature, as do modern games consoles. Devices like printers and Hi-Fi systems tend to not support this feature, however. A smartphone is much more than just a phone. It will contain a host of data, files and information that are vital to the owner. It is only when any of these are lost that it becomes obvious how important they are. Backing up a device is a task that often gets overlooked, but it is one that should be instigated on a regular basis. To make sure that data and information is safe and sound, the help of a third-party app is needed. There are a host of free and paid-for apps on the Google Play store that are perfectly capable. For this tutorial the services of MyBackup have been employed. The app is available in several guises, including the free version used here. On offer is a simple and intuitive interface that allows users to back up, restore, manage, view and schedule applications, media and data. Backups can only be installed via a removable SD card or online. Note that the online option only provides 2MB. For more space, users will need to upgrade to the Pro version of the app. The associated setup screen will appear each time the MyBackup application is started. Add a password and email address and tap OK to send the login information to the address added previously. This will set up the password and complete the account setup process. Head to www.rerware.com, select Web Viewer and log in to view your backups. To get started, tap Backup. Select Applications & Media to back up apps or media, or alternatively, select Data to back up data. The next step is to choose the backup location. Select from Local (SD card) or online. On offer are four different options: Apps, Photos, Music and Videos. To back up all the files in a section, eg Apps, simply tap the available button. An active option will display a green tick. To select individual items from a category, tap Select All and choose items to back up. When complete, tap OK and give the backup a name. Hit OK to start backing up. To back up data, select Backup, choose Data and select the backup location. A list of data to back up will be displayed including Contacts, Bookmarks, SMS, System Settings, Dictionary and Calendar. Tap Select All or choose individually. Press OK, name and tap OK again. To get started, tap Restore and select Applications or Data. Note that the free version does not allow users to restore from online. Select the Local option which lists available backups. Select a backup and choose which apps or media to restore and press OK to begin the process.